Holland America's fifth Rotterdam was built by Rotterdamsche Droogdok Mij and was launched by Queen Juliana in September 1958. Like many of her contemporaries, Rotterdam was designed for two-class transatlantic service in summer and one-class cruising in the winter. She served in those roles for the first ten years of her career, after a 3 September 1959 maiden voyage from Rotterdam to New York. 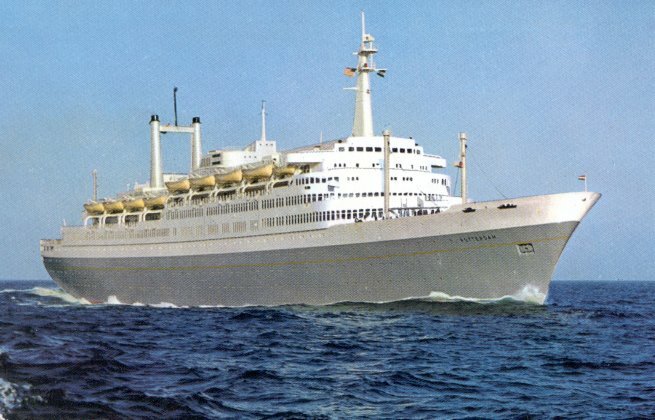 From 1969 on, however, Rotterdam saw cruise service only, with only occasional positioning crossings of the Atlantic. She cruised for Holland America (and related companies) until 1997, when she was sold to Premier Cruise Lines and renamed Rembrandt. Premier failed in September 2000, however, and Rembrandt has not sailed since. As of this writing (March 2002), she is laid up at Freeport, Bahamas, where she has been since Premier's collapse, and her future is very much in doubt. Sources: Bonsor's North Atlantic Seaway; Haws' Merchant Fleets; Kohler's The Holland America Line; Cox's Maritime Matters Web Site; Steamship Rotterdam Foundation Web site.